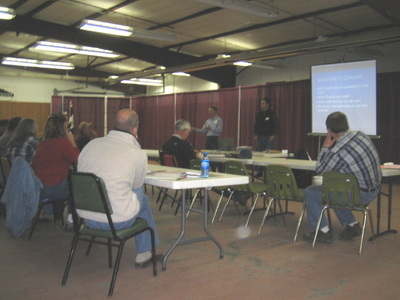 Even with competition from the Health Fair, Basin Crazy Days and Youth Fishing Day, a crowd of 28 people attended the Small Acreage Workshop co-sponsored by the South Big Horn Conservation District (SBHCD), Big Horn County Weed and Pest, and the Big Horn County Farm Bureau and landowners Carolyn Walton and June Booth. 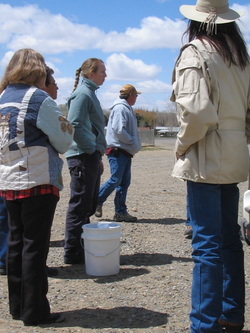 The workshop was funded by a Barnyards & Backyards grant through the Wyoming Department of Environmental Quality 319 Non-Point Task Force, which focuses on improving water quality throughout the state. 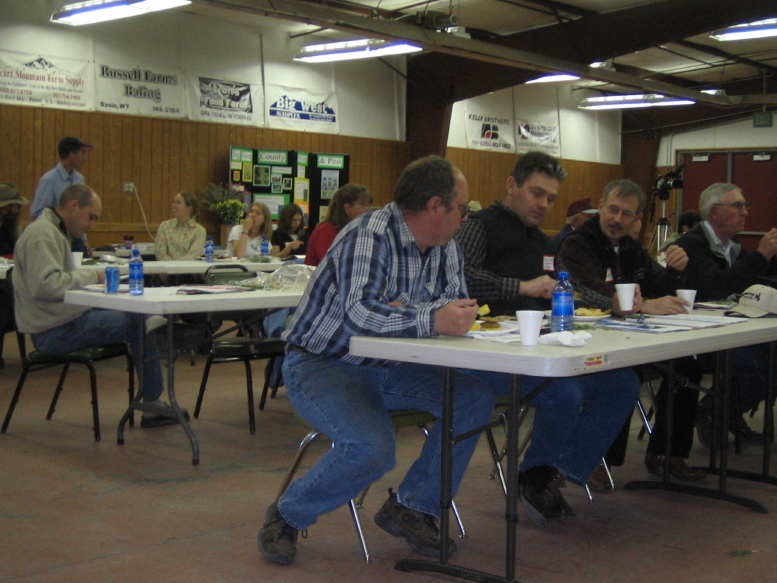 Water quality issues were addressed in nearly every segment with discussions about managing manure and composting it, keeping livestock out of streams to reduce erosion of stream banks and the possible contamination of water from livestock and pets. Ben Bonella, Natural Resources Conservation Service, and Dallen Smith, Big Horn County UW Cooperative Extension, gave the crowd all sorts of ideas on pasture seed mixes, rotational grazing and general management of livestock on small acreages. The weather was perfect for the hands-on demonstrations for back pack sprayer calibration by Ruth Richards, supervisor with Big Horn County Weed and Pest. 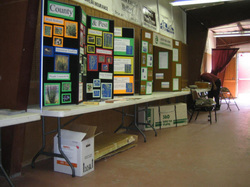 Richards also spoke on weeds pervasive in the Big Horn Basin and methods to control them. Loren Smith, District 3 supervisor with the State Engineer's Office, fielded many questions concerning water rights, ditch casements, livestock and fences in irrigation ditches. In his trees and landscaping talk, Scott Hininger, Sheridan County UW Cooperative Extension Service, presented many alternative choices besides planting cottonwoods and green ash trees. All attendees received an eastern red cedar and a Colorado blue spruce tree donated by SBHCD. Cheap land prices or the desire to own your own little “slice of heaven”? Whatever the reason, more people are moving onto small acreages in southern Big Horn County. In an effort to ensure water quality isn’t impaired by these newcomers, the South Big Horn Conservation District board decided to reach out to these landowners and offer information and assistance in managing their property. On August 18, 2007, the SBHCD held a Small Acreage Workshop at the Big Horn County Fairgrounds in cooperation with the Big Horn County Weed and Pest, Farm Bureau, NRCS and UW Cooperative Extension Service. Nearly 50 people attended to hear experts in the fields of irrigation, water rights, grazing, mediation, native and xeriscape landscaping, septic systems and water quality as well as hands-on weed identification and sprayer calibration. Juli Harrison prepared the fantastic enchilada lunch and no one walked away hungry. After lunch the group learned the intricacies of sprayer calibration from Weed and Pest Manager Ruth Richards. Originally, the SBHCD, Weed and Pest and Farm Bureau submitted a grant application to the Small Acreage Team at UW Cooperative Extension Service and received a $1200 grant. Unfortunately the grant money was not available at the scheduled workshop date so the three sponsors covered the costs themselves. That grant money is still reserved for this group for another workshop. Speakers included Rachel Mealor on exurbanites, Jim Gill-irrigated pastures, Russ Holzhauser-xeriscape and native planting, Jim Waller-septic systems and water quality, Dave Deutz-water rights issues, Barton Stam-grazing on a few acres, Ruth Richards-weed id and sprayer calibration, Laura Galloway-irrigation water management, and Larry Bentley –mediation and conflict resolution. Several agencies and companies set up booths or gave out freebies including: Wind River Seed, South Big Horn Conservation District, J & E Irrigation, Big Horn County Weed and Pest, Wyoming Livestock Reporter donated copies of their latest newspaper, Backyard to Barnyards magazine. Door prizes were donated by Big Horn Coop, Big Horn County Weed and Pest, Wind River Seed, J & E Irrigation, Pepsi and Terra Logics. Despite the blazing August heat and flies, workshop participants walked away with more knowledge of the subjects presented and a real desire for another workshop.